A special welcome to Legends Radio, Tideline Ocean Resort & Spa, JonesHaus – creative direction + design, Bring A Trailer, Double Cross Vodka, Northwood University, CarShow TV, Raluca Vision, Roxworld TV, MB Realty, VineCraft and Mariani Marketing and Events. Oceana Coffee of Tequesta, FL is our official coffee partner The owners, Amy and Scott, are true car enthusiasts who own a Jaguar E-type coupe in a beautiful shade of blue. Expect some great gourmet coffee throughout the weekend. Welcome to Ferretti Yachts. Scott and Peter have graciously agreed to host our VIP party on Worth Avenue on Saturday, March 21 at their beautiful showroom. Steve Wolf bringing his Pebble Beach winning 1929 Dusenburg. It will be featured in our Historic Display Retrospective at Mar-a-Lago on Sunday, March 22, 2015. Florida Builders Appliances has teamed up with Gaggenau, maker of world-class premium appliances inspired by European technology and beautiful design. Gaggenau will be providing gourmet kitchens for live demonstrations by celebrity chefs. A special welcome to Whole Foods Market, our newest partner. They are excited to provide complementary gourmet gift baskets to our participants. The owners of a very special 1964 Ferrari 250 Lusso have generously agreed to display their car during the weekend. This gorgeous car has recently received a no expense spared restoration. Welcome to our exclusive wine sponsor, Penfolds Wine. This exquisite Australian Vineyard is providing their best wine for our collector car weekend. You don't want to miss this. Brown and Brown Insurance is excited to announce its promotional relationship with The Palm Event. SunTrust Private Wealth of Palm Beach announces its partnership with The Palm Event. They are generously hosting our vintage Kennedy yacht party. Jack Morton Worldwide representing Cadillac and General Motors agrees to become a major promotional partner. Porsche agrees to become a major sponsor and participate in our Ride & Drive Program. The Dezer Collection of Miami announces its commitment to bring several authentic James Bond 007 movie cars. Carroll Shelby's personal car is scheduled to attend. This rare '67 GT500 convertible is very significant piece of American history. The only one built by Shelby America. Ferrari of Palm Beach announces plans to offer Ride & Drive in a California T at Mar-a-Lago. The Wall Street Journal to become major sponsors and offer free tickets via a promotion to more than 180,000 subscribers. More information coming soon. Brian Barr of Charlotte, NC assisting with historic display car recruitment and business development. 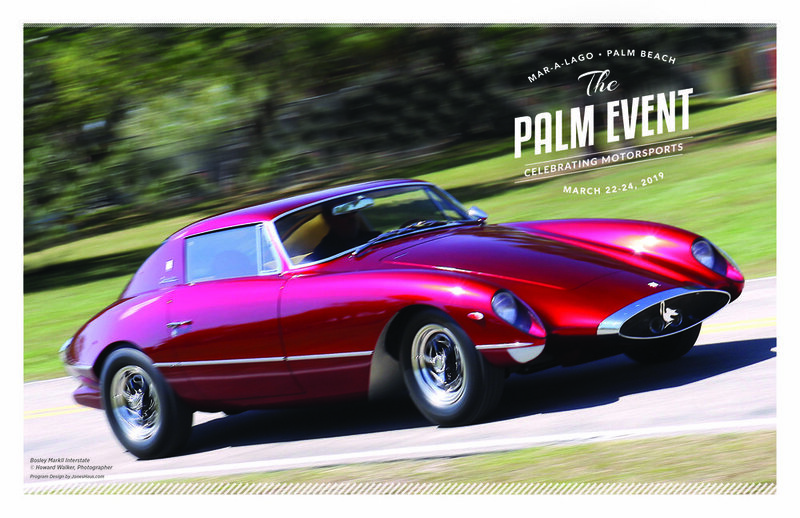 Ferrari & Maserati of Palm Beach become The Palm Event first sponsor. Scott Shrader, 42, president of the fast-growing ‘The Palm Event’ sporting car lifestyle weekend, explains how his Jaguar F-TYPE convertible model makes an exciting daily driver. Shifting Gears – A lifelong love of cars sets Scott Shrader on a serendipitious course. If you love great cars, love great food and wine, love great coffee, the place to be this past weekend was The Palm Event, held on the manicured lawns of the PGA National Resort & Spa.This was the third year for this celebration of world-class classic and exotic automobiles organized by the untiring Kevin Ream to help raise money for Wheels for Kids. More than 100 cars were on display, many from the remarkable collection of Palm Beach enthusiast Larry Wilson. Headliners included his spectacular 1954 Maserati A6GCS Spider racer, a rare 1966 Ford GT40, and searing-yellow 1954 Jaguar D-Type that raced at Le Mans in ’57. Palm Beach, FL - The Colony Hotel, The Breakers Resort, PGA National Resort and Spa. Vintage Car and Food & Wine Festival Weekend. The Third Annual The Palm Event is building momentum. Management expects over 100 collector-quality, vintage cars to attend the weekend’s events. The company unveiled two of the newest re-imagined 911s which will debut at the Amelia Island Concours d’Elegance and The Palm Event. If you don’t know the name Singer Design, you’ve probably seen one of their commissions in a magazine or elsewhere online. Singer takes vintage Porsches and throws copious amounts of time and craftsmanship, turning them into rolling works of art. Singer Porsche has just dropped two of its latest commissions meant for East Coast clients and they’ve been given the green light to parade them at two Florida Concours events. Dubbed The North Carolina Car and The Florida Car, both will be making an appearance at the Amelia Island Concours d’Elegance and The Palm Event following afterward. This past March saw the kickoff of one of the premiere automotive events in Palm Beach County, “The Palm Event”– heal at luxurious Mar-A-Lago club on Palm Beach island. This event brings a certain “west coast flair” to the eastern shores, in a multi-day celebration of Fine Foods, Wine, and Cars. It started with a yacht party at Rybovich Marina, with an elegant sunset party aboard what was John F. Kennedy’s Presidential Yacht, the “HoneyFitz”. Remember last week when we told you the Car Show Television crew would be headed to Donald Trump’s stunning Mar-a-Lago Club for the inaugural Palm Event? Well, in case you haven’t already figured it out…WE HAD A BLAST! The town will celebrate elegance and nostalgia this weekend with a series of events highlighting luxury vintage cars. The Palm Event, produced by resident Kevin Ream, will feature a collection of vintage cars from the 1920s to the 1970s on display. Events from Friday to Sunday will include cocktail parties, a driving tour of the town and a vintage car show, with ticket prices ranging from $90 to $900. Quaffing the finest wines and Champagnes. Fine-dining on gourmet delicacies rustled-up by some of Florida’s top chefs. And all the while gazing at over 100 of the world’s finest classic cars displayed on the manicured lawns of Palm Beach’s Mar-a-Lago.